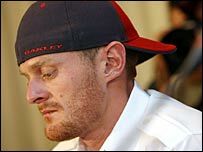 Floyd Landis is set to lose his Tour de France title and faces a two-year ban after returning a positive B sample for excessive levels of testosterone. The American's Phonak team dismissed Landis on Saturday when it was confirmed he produced levels more than twice the legal limit after stage 17. Landis, 30, has said the high levels detected were a "natural occurrence". Spaniard Oscar Pereiro will be declared the winner of the Tour de France if Landis is stripped of the title. Pereiro was second overall behind Landis in the race, which finished in Paris on 23 July, and would become the first Spaniard to win the Tour since Miguel Indurain in 1995. The official decision to strip Landis of the victory rests with the International Cycling Union (UCI), but Tour de France director Christian Prudhomme said: "It goes without saying that for us Floyd Landis is no longer the winner of the 2006 Tour de France." Landis said in a statement: "I have never taken any banned substance, including testosterone. "I was the strongest man at the Tour de France, and that is why I am the champion. "I will fight these charges with the same determination and intensity that I bring to my training and racing. "It is now my goal to clear my name and restore what I worked so hard to achieve." His lawyer Howard Jacobs added: "In consultation with some of the leading medical and scientific experts, we will prove that Floyd Landis's victory in the 2006 Tour de France was not aided in any respect by the use of any banned substances." A Phonak statement said: "Landis will be dismissed without notice for violating the teams internal Code of Ethics. "Landis will continue to have legal options to contest the findings. However, this will be his personal affair and the Phonak team will no longer be involved in that." The analysis of Landis' B sample took place at France's national laboratory at Chatenay-Malabry in the presence of the American's Spanish lawyer, Jose Maria Buxeda, and experts from the United States Anti-Doping Agency (USADA) and the UCI. "In accordance to the anti-doping rules, the Anti-Doping Commission of the UCI will request that the USA Cycling Federation open a disciplinary procedure against the rider," the UCI said in a statement. According to the good behaviour charter of professional cycling, Landis would not be allowed into a Pro Tour team for a further two years. He now has 10 days to respond to the documents that are provided, according to USADA rules. Landis' lawyers could then take the matter to the Court of Arbitration for Sport (CAS). Those documents, Landis's response and any documents USADA would provide will go to a review panel some time after the 10 days. The review panel will make a recommendation whether or not there is a case. USADA, based on that recommendation, will then decide whether to charge Landis. If USADA does charge him, he will have an opportunity to contest that decision and the recommended sanction before a US panel of judges. The American's future was already uncertain given he is due to have a hip replacement operation shortly. Speaking in Madrid last week, he said the testosterone was "absolutely natural and produced by my own organism". Landis produced one of the most memorable displays in Tour history when he stormed to victory on the 17th stage of the Tour into Morzine by almost six minutes. The win put him back into contention for the yellow jersey a day after his chances looked to have evaporated when he cracked on the final climb of stage 16. But a two-year ban could spell the end of his career.